The bodyCushion is a high-tech, high-quality body positioning system that allows a person to lie in any position without unnecessary pressure on soft tissue areas. Supporting the body on its bony structures - clavicles, ribs, sternum, pelvis - enables the body's soft structural components to relax, deeply. The 4 piece bodyCushion™ supports the body on its bony structures, allowing the body to rest facedown, faceup, side-lying or seated without pressure on sensitive soft tissue areas. Unloading the body is therapeutic in itself, facilitating improved outcomes for all types of applications. Split leg support (pictured). Must use adjuster set if using for pregnancy massage. Face, Chest, Pelvic, Leg Support. Available in Blue. The bodyCushion is a high-tech, high-quality body positioning system that allows a person to lie in any position without unnecessary pressure on soft tissue areas. Supporting the body on its bony structures - clavicles, ribs, sternum, pelvis - enables the body's soft structural components to relax, deeply. This is the 3-piece set which includes the Face, Chest, and Pelvic Supports. All pieces are connected with Velcro® straps. Available in Blue. 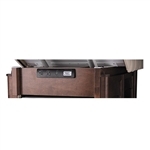 It�s a great way to add new life to your existing table, while outfitting it to offer the ultimate in enhanced comfort.